General Manager Kyle Dubas joined Prime Time Sports and TSN Overdrive on Tuesday evening to discuss Auston Matthews’ new five-year, $57.1 million contract extension. Dubas touches on the difficulties of the cap situation in 2019-20, why the two sides couldn’t find an eight-year solution, the lack of true comparables for Auston Matthews, possible trade activity before the Feb. 25 deadline, and much more. The transcript below has been edited and reordered for clarity. How much discussion or how would you characterize the discussion when it comes to term between the Maple Leafs and Auston’s camp? Would you say that one side was working with an eight-year framework to start and then moved? At least in terms of the specifics on term, how would you characterize that negotiation? Dubas: At the beginning of all of these discussions, if you are certain about the player and the player is certain about the program that employs him, everyone looks to try to maximize their time together. With these younger players across all sports, you are buying up a lot of their prime. Unlike an older player, where if you’ve given them more years the salary usually reduces, with a younger player, you’re buying up the prime so the AAV only increases. That has been the trend and the norm around hockey. When we went into the discussion, I think everyone wanted to do an eight-year term, particularly Auston and his camp. They wanted to be here for the eight. We just couldn’t find an AAV at that term that was going to best work for the club. That is no slight to Auston or anything else, but it was just the reality. We knew what our internal capabilities and where we would need to get to. And then it was finding a term that would satisfy them on an AAV that would work for us. That is what we spent the last month or months really chipping away at until we got to this point. Obviously, during that time, a player’s sample size continues to grow and his performance metrics are expanded upon and you know more of what you have the more time you spend with anybody, no matter how long it is. The longer you are with them and the longer they perform, the more certain you are about their capabilities. He’s obviously had an excellent season for us again, so we were thrilled to get it done and for the city and the organization to have him locked in here for five and a half more seasons. It is an usual number. We usually see things with round numbers. You can divide the number of years into the overall number and come up with something that at least ends with a bunch of zeros. How come this one is kind of goofy at $58.17 million? Dubas: Yeah, I think the 34 is Auston’s number. It is a number of significance to him. That was important to their camp, so we just found a way to kind of make it get there. I certainly understand where the question comes from, but that is the answer. You guys looked at everything from a three-year deal to an eight-year deal and you wound up at five. Was this where you wanted to be or did you go into it with a pre-determined number in your mind? What was your thought process? Dubas: We didn’t go in with a pre-determined number of years in mind. We examined a lot of the contracts in the past and I think in recent history a lot of them have been eight-year contracts. If you go back a decade or so, and go through those Pittsburgh and Chicago and LA contracts, they are mostly five-year deals and some are six. We didn’t go in constrained to having it be an eight-year deal or a one-year deal. We more wanted to work through the process with Auston and his camp and figure out what was going to work best for us knowing that we are fortunate to have a very good collection of talent here and in a salary cap situation we have to try everything we can to keep it together. The term may not always end up being optimal, and when I say optimal, I mean the maximum amount it can be. For us, there is a trade-off in that we don’t have it as an eight-year contract and for them, there is a trade-off in that it is three years less and the AAV is less. I think we were able to amicably work towards an agreement and make good progress, especially in the last month. That is how it ended up where it went, but we didn’t go in with any preconceived notion of where it would end up. The signing bonuses in this deal account for 90+% of it. $54.5 million of the $57.1 million is in signing bonuses. Tell us why that has become the modus operandi for not just the Toronto Maple Leafs but for other guys as well? Dubas: I think most players and most people employed in general, if they could, would prefer to have their dollars up front. For us, there are some benefits to doing so. We have the means here to do it. For us, across a number of different contracts that we’ve done, it gets the players up front and maybe saves us in other areas but also gives us greater flexibility with the contracts as well. That is kind of the way it has gone with these types of players, in particular, coming out of their entry-level contract or any other contract. They are largely constructed this way. Are there tax implications, positive or negative, for Auston in signing a deal that is signing bonus heavy? Dubas: Well, that is more of a personal thing with Auston, but he is a U.S. resident. When you are a U.S. resident, and being from Arizona — Scottsdale is his hometown — there are various different things that you can do within the contract to take advantage of. But that is not something I feel comfortable speaking about because it is a more personal matter for Auston and probably a question better posed for his representation when they speak. You must be aware of this and what the implications could be. Just in the generic sense, would you perceive that there are significant tax benefits to this kind of a deal over a salary structure deal? Dubas: I think that the benefits, especially if you do qualify as a resident in a lower tax jurisdiction, it would be prudent, regardless of what that jurisdiction is, to allocate your dollars there as much as you can. Of course, you have to qualify by spending the requisite number of days in that jurisdiction whether you are a Florida resident or an Arizona resident or really anywhere in the U.S. versus Canada in terms of taxation. Now, there are some high-tax states in the NHL as well, such as California and New York, that we compete with, but some other states are well known for being low tax jurisdictions and thus it is apt for the players and representatives to try to maximize their dollars because though the salary and dollars are immense, the careers are relatively short. I think they have done an excellent job. That was a lot of the discussion in the last day and days working with not only the agents but the finance people on making sure that Auston was set up well not just for now but for his retirement and in the future. When you are doing a deal like this, how often do comparatives come up? It is one thing to have a guy who is a middle-of-the-road player and the agent comes in and will say, “Well, he is better than this guy who got this, or this guy who got that,” and then you’ll go back and say, “Yeah, but he’s not as good as this guy who got this.” Those kinds of back and forths. You are very limited with a player with Auston’s skill and status in comparatives, aren’t you? Dubas: I think especially the position he plays as a center. He is a franchise-type center and he also scores goals at an elite rate, which is not all too common for a center. There have been centers who have produced a lot of points, but very few that have scored at the rate that Auston has. If you go one further to even-strength goal production, he is right at the top again, not just in the recent past but going back. That is what made the comparable portion of it rather difficult. There weren’t a whole lot of people there. You are looking at the very upper crust of players and they are coming out of entry-level nearly a decade ago. There are very few players who kind of fit that bill. You kind of the hit the nail on the head there. It is easier when there is a greater collection of comparable players in terms of production and position and for him, there really isn’t. You maybe want the deal done a little bit sooner, but when you are working through all of that plus all of the other matters we discussed previous, it can lengthen the discussion a little bit. There are 14 players you currently have under contract for next year at a total of approximately $71 million. The cap will be $85 million. How are you going to fit this all in there? You have a plan and have a board. Is this concerning to you? You are going to have to do some juggling here. Dubas: I understand your concern. You’ve done your research and know the situation that we’re in. I think that we talk about this every day and we go through this every day, really, since going back years now. It has not been something that we say, “Okay, we’ll get all these contracts done, then we’ll worry about it.” It is a discussion that we have here ongoing daily. In our prognosticating, we know that next season will be our toughest year, and then the salary cap has grown every year, so with that and different things that will occur and happen, we’ll start to gain some breathing room. I think next year the pressure to execute what you’ve outlined falls solely on me and filling the edges of our roster. As you just outlined it, it’s essentially just $14 million across six bodies to field a team each night. Once we kind of get through this next stretch and get through to the summer, we’ll have more certainty on our other RFAs and the pressure to fill around the edges of the roster and make sure that we are performing well will fall directly on me. I know that is what myself and our management team will be judged by and what the fans and the media should be judging us on. I am excited about it. We’ve worked extremely hard at it. We won’t be right all of the time or a lot of the time, but it’s trying to be more right than wrong and give our coaches and players — who have done such a great job this season and in the past — the ability to keep reaching their potential. That is what we will keep working towards. Five years, $11.6 million makes all the sense in the world for the player. Take us through the team side of it. How does it benefit the team, this specific contract? Dubas: I think the key for us, given our circumstance — and I know there had been a lot of other deals that had been these eight-year deals — we are at a different stage, one away or another, than the other teams were. I don’t think we get too focused on what other teams are doing or how they are handling their contracts. 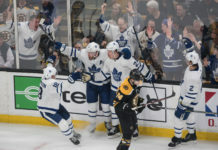 It is what works to give the Toronto Maple Leafs the best chance to be successful and to maximize our window here with this young core of players. When we were going through it and projecting out where everyone was going to sort of come in at, we had a range of how much we could spend and put into these players. The pressure will fall onto myself and our management team to fill out the edges around the core. We sort of worked through it and found a comfortable range as far as the AAV, and then it was just kind of working that and the term at the same time. That is how we came to the five years. The five years has not been used a lot of late, but if you go back a decade or so to teams that were in the position we aspire to be, they were contending year in and year out. We are not quite there yet, so I don’t want to put us in the same breath as those teams, but that’s what they did to make it work then. That was when there were no term limits at all. They just did five-year deals and they were comfortable with the AAV there and we were as well, given what Auston brings to the table for us in terms of the position that he plays and his ability to score goals. It is exciting for us. We are excited to get this one done and out of the way and look forward to the next five and a half seasons at least of Auston here. What did you learn from the William Nylander negotiation that you applied to this negotiation? Dubas: I think they are so different, right? The Nylander negotiation was picked up when I came into the job in May with a very short timeline. Though I had been with the Marlies and we had a relationship before, it had been a couple of years, so you’re picking that back up again at a much different stage. With Auston, it was a discussion with Judd after he came to represent Auston whenever that was — June — just kind of prepping for July, when we could start formally speaking about it. We started that process a long time ago. With the Nylander situation, that wasn’t so much the case. It was a few months before the season was about to start. If anything, trying to get a handle on how these things ebb and flow, we were going to have two more of these things to go through and possibly more than that. It is a good problem to have when we have these types of young players coming through. Really, we wanted to spend more time focusing on it now, if there was progress to be made, rather than wait until the summer and leave it to chance. You mentioned in the Muzzin negotiations that you had a pretty good ballpark of where the Auston Matthews negotiations were going. How does that apply to Mitch Marner? His agent has said that at this point, the Marner camp is not really interested in negotiating during the season. Do you have a decent read or a quality read on where you think that is going? What can you tell us about it? Dubas: Yeah, I wish I could give you a certain answer. We have been respectful of Darren and his wishes of wanting to wait until after the season to talk shop. We will do that. It is very clear how we value Mitch. He is a fun player to watch night in and night out. The amount of joy he brings to the rink every day is outstanding. He brings leadership in that way to our group and he has obviously been one of the top players for this team for a long time and has asserted himself into that conversation in the whole NHL this year. He brings so much to our organization and we are fortunate to have him and all of our others. We will look forward to finding a way to lock him up as well with our organization when that time presents itself. It has got to be something they’re comfortable with because of the personal nature of it and how they want to handle those discussions while he’s also focusing on hockey. Mitch Marner’s agent has said publicly that they will not negotiation in-season. When a player and an agent make a statement like that, how do you navigate that, understanding that you obviously want this player signed? Dubas: I think that we respect them. I certainly understand why a player and his camp and his family would elect that option. They want to focus on playing hockey and focus on the season, and Mitch has had an outstanding season. He has been an excellent player for us now for three seasons. As I said today, his enthusiasm and his love for the game, and his love of being a Maple Leaf, you see it day in and day out. We are very lucky to have Mitch. I think we just continue to focus on continuing to help Mitch reach his extraordinary potential and work with him. It doesn’t affect the day-to-day for me and for us, and if it ever did, we would have a discussion with Mitch and his people. We’ll just be respectful of him and his wishes, and once the season ends, we will get to it. Now that you know the number and you’ve got cost certainty with Auston, obviously, there is still some more work to do. How does this affect, if at all, your plans leading up to the deadline? Dubas: I think we kind of knew the range that we were going to end up in in terms of the AAV, just depending on the years that we did, in the last few weeks. Once we kind of knew we were making progress with Judd Moldaver — Auston’s agent at Wasserman — we were able to certainly pursue some options. That was what really made us comfortable executing the trade for Jake Muzzin because he does have another year on his contract left after this. We know what he makes, and then knowing whereabouts Auston was going to come into, we had some other elements we needed to finish and work on, but I felt comfortable with the discussion with Judd and their camp that we could go ahead and add Jake. That was something that was a big help to us and something that we talked about previously. Just selfishly, that would be a major benefit to our organization if we knew that before. That was a major help in the Muzzin acquisition. Now we’ll have a better idea here in the coming weeks of what we have. We’ll let the cap space accrue over the next few weeks and we’ll see if we can improve our team a little bit more. The acquisition of Jake Muzzin has certainly been a big splash around Leafland. He was brilliant last night — kind of the best of Jake Muzzin on display. Everything is terrific back there right now. Was there a timeline that you wanted to stick to as far as the acquisition of the player? Did anything internally speed that process that up, whether you liked something or didn’t like something with your group on the backend? Dubas: No, I think after giving some time to get to know the team and watch the team, we had defense as an area that we wanted to focus on and try to find an upgrade if we could if the cost were to be reasonable and we were comfortable with what we had to part with and also if the player was also someone who was going to have some term and was going to be here for more than just a few months, or if you acquire them close to the deadline, it could be just a few weeks. That was the impetus to make that deal. We had been talking with LA for about a month before. Rob and I continued to stay in touch. Once we had some more certainty on Auston’s situation and we knew it was kind of heading that way, we were able to be more certain in our offers and in our situation in dealing with LA and other teams. The LA one just came together. We decided to go ahead with the deal and improve our team and get Jake in here as soon as we could. We thought it was important as well that we were coming out of the break and to be able to give him as much time as possible and have him on our team for as long as we possibly could. It just adds to the value for us and similar for them. They get the two prospects in their system and they can get them rolling as well. What percentage would you put on additional trades or transactions prior to February 25th? Dubas: I don’t know. We continue to explore everything. It is so hard to put a percentage on it. Whether here or other places, I’ve felt before like we are 100% going to make a trade to improve the team and it didn’t happen. There were other times where it was a remote chance and we executed a deal. I think we have made a big addition already in Jake Muzzin that we are happy with. We will continue to explore all options that we have given the cap space that we have and the opportunities that we have to improve the team. I don’t think we will be constrained to one particular player or position if we feel we can improve our team and give this group of players and coaches the best chance. I think they’ve earned that. We will keep looking at it and exploring it at the same time. We are excited about our group and excited about our players that are developing below and the fact that the core of our team is mostly very young and we can expect them to continue to improve as it rolls along. How would you categorize the trade conversations you’ve had leading to the deadline? Is your perception that it is an active market or a passive market? Dubas: There are lots of calls. Very similar to when Lou was here and observing here and Dave Nonis before that, there are lots of calls going back and forth with teams trying to find their way. There have been a lot of teams that have played great of late that were previously on the outer edges of the playoff race. That has sort of changed the dynamic a little bit. There have been some teams that have made a strong charge of late and played very well. That has changed things a little bit, but there is still lots of discussions ongoing and we will continue to be involved in those. It has been a fun, interesting process for me as a younger person and a first time GM to learn from the other managers and how they manage this time and how they operate, whether they are buying or selling or just staying the same. It is always interesting to hear how they go through their process and then observe it. Good learning experience for me and for us and we are looking forward to the next number of weeks and seeing how everything shakes down. Even if this was filed under exploratory, did any other organization this year make a call to you about either Auston or Mitch in terms of availability? Dubas: No, I think only in pure joking terms. There was never any serious inquisition with us about either of those players. They’d just kind of laugh and say, “We’re calling regarding Auston Matthews or Mitch Marner,” and then go ‘ha ha’ and that was the end. Nothing serious. We are obviously thrilled to have them and fortunate to have them and look forward to them being Maple Leafs for a long, long time.